Crunch crunch crunch. We’re walking on an old lava field, from one of the last lava flows in Maui’s history, possibly 500 years old. It sounds like walking on tortilla chips. 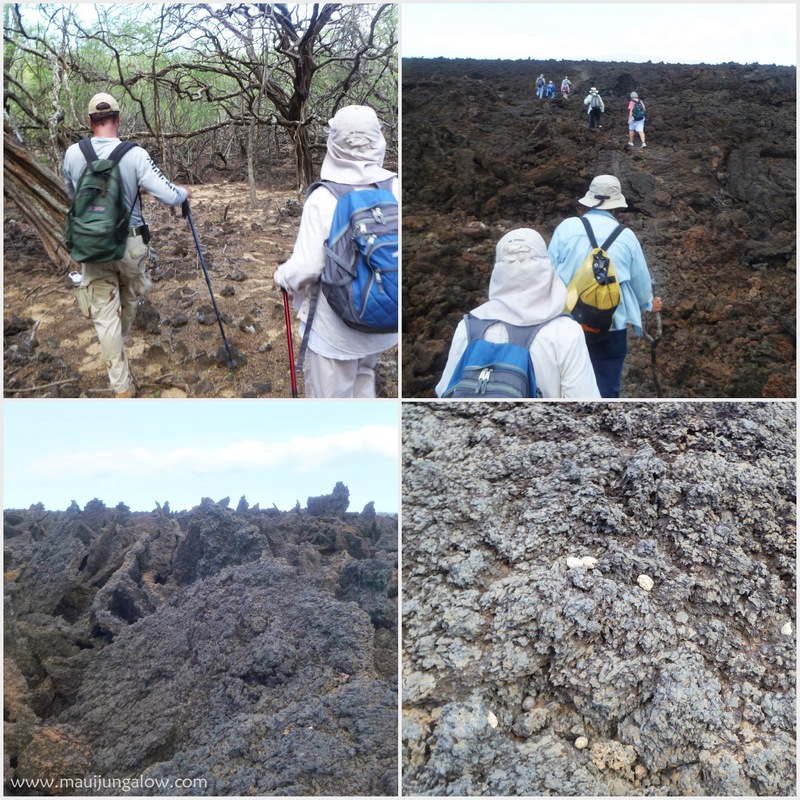 walking on the old lava flow, jagged rocks, and bottom right: goat pellets. So I just had a tremendous wake up call this week. I love this quotation from French writer, Andre Gide. Came across it recently, and it speaks to me. My posts will be less frequent, maybe only a couple of times this month or next month. After listening to Jon Morrow's webinar on launching a blog, I realized I am doing something wrong. Ouch. It was the same webinar I had listened to in January or December. Ouch. Same message. Ouch. I'm not willing to pay the hefty price to take his intensive training, but will do my best to apply his message. I will be focusing on making a Facebook page for this site, revamping some older posts, doing better descriptions, doing more guest blogging, refining my newsletter, redoing my Etsy store, redoing Pinterest (they have a nasty copyright violation policy which affects everyone), and doing some deep inner work. Plus I never got around to accepting four Liebster Blog awards from April and I want to do that (This also requires answering some questions). If you’d like to stay connected and know when the next real post will be up, sign up for the newsletter (upper right corner if you're on a desktop or below). People who sign up will get first notice of when a new post goes live. To tempt you, some posts I’m working on: a journey to a secret spot on Maui, the rest of the infamous Road to Hana Trip series, and other tales of life and madness on Maui. I only send the newsletter out once every two weeks, or maybe twice a month. For a sample of what it looks like, here’s the latest issue. I won’t spam you! I personally hate spam and excessive emails. A to Z Challenge - Exploring the cultural icons of Hawaii, and debunking them! Grass shacks! Bah! Grass skirts! Bah! Coconut bras! Bah! 26 posts in 26 days from A to Z. If you sign up for the newsletter, I'll also tell you when and where I'm guest posting. You can also send me feedback by commenting below or email me direct at maui jungalow (at) gmail (dot) com. Take out all the spaces and punctuation so it looks right! On twitter, I can easily be reached at @mauijungalow. If you've loved any of my posts and would like me to guest blog, please contact me or comment below. Big Beach on Maui's South Shore has some of the most intriguing waves I’ve ever seen. I’m not a wave expert, oceanographer, or a surfer, but the wave patterns here are kind of strange. Tail end of a T-shaped wave. A brown speckled egg from one of the Rhode Island Reds. I found this post in my drafts, from a year ago! A very short post today, because I feel pretty darn eggs-hausted from the new chickens who arrived last week. I have been googling chickens, asking random people about chickens, and learning to understand chicken sounds. There are three of the little terrors, and now I understand why chicken eggs are $6 or $7 a dozen on Maui. They are all females and I was told that chickens can't have PMS, but you could have fooled me. They are sometimes quiet, but more often than not, loud, especially when I'm trying to work. They were always kept in a cage, and I am trying to teach them to free range. It has been a bit feather-raising for all of us, but some progress is being made. This informal calendar will be updated as time permits. Events are subject to change, so please check the linked websites for updates. I tend to focus on free or low-cost events. but I wanted a picture! 8/2 – First Friday in Wailuku, Town Party.